from User Review: Tom Clancy, the famous author of military-style thrillers, long been a wargaming fan. 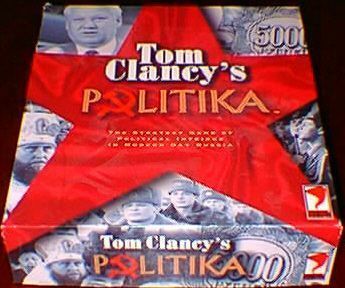 Now, he has entered into the wargame market with Politika, produced by a company of his own, Red Storm Entertainment. The premise of the game is that Yelstin has died and there is now a power struggle amongst various factions within Russia to take control of the vast country. The game is billed as 'The Strategy Game of political intrigue in modern day Russia'.